alaTest has collected and analyzed 75 reviews of Jura ENA 9. The average rating for this product is 4.0/5, compared to an average rating of 4.2/5 for other products in the same category for all reviews. People are impressed by the design and performance. The maintenance and usability also get good feedback. Some have doubts about the size and capacity, and comments are divided on the noise. We analyzed user and expert ratings, product age and more factors. Compared to other products in the same category the Jura ENA 9 is awarded an overall alaScore™ of 84/100 = Very good quality. alaTest has collected and analyzed 7 user reviews of Jura ENA 9 from Amazon.co.uk. The average user rating for this product is 4.1/5, compared to an average user rating of 4.3/5 for other products in the same category on Amazon.co.uk. Reviewers really like the maintenance. The noise also gets good feedback, whereas there are some negative comments about the usability. Doesnt make flat white, cant interrupt cycle to add water/milk/beans, customer service nonexistent. Small holders for beans, water. Good cleaning and very easy cleaning afterwards. I can now mix and match my own combination of coffee beans. Wonderful froth when selecting macchiatto. The water tank container should be bigger to cater for those after dinner drinks. 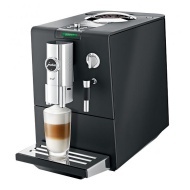 Makes Great Coffee, Lots of Settings, Easy to Use, Fully Automatic, Compact, Good Looking, I have one! Cannot make just frothed milk without using a coffee shot. I have become a cappuccino addict!